Let’s take a moment to remember the only fan who was on board that ill fated aircraft – Willie Satinoff. It’s always been a sadness to me that he tends to be forgotten on the anniversaryday, and I just wish that there was some formal recognition of him in some way at Old Trafford, maybe in the form of a small plaque. He was one of us – a fan – who loved the Club, loved the team, and gave his life following them. The following is the introduction to a piece I wrote for MUST/RN and will give you a little insight as to how fate played such a huge part in United’s future. George Whittaker bitterly opposed any recommendation of Louis Edwards as a Director at Manchester United. Willie would certainly have become a member of the board, but all within a week, Whittaker died, Willie died, and and on Saturday, February 8th 1958, at an emergency Board Meeting, Edwards was opted onto the Board as a Director. On Friday, January 31st 1958, the Manchester United team, officials, and directors, traveled down to London in readiness for the team’s fixture against Arsenal which was to be played at Highbury the following afternoon. On Saturday morning, February 1st 1958, one of the Manchester United directors, Mr. George Whittaker, a Manchester business man, was found dead in bed in his hotel room. He had passed away in his sleep during the night. That afternoon, as a mark of respect, players from both teams wore black armbands, and a minutes silence was observed by both teams and the 55,000 fans attending, prior to the match kicking off. The game itself is widely remembered, even today, because that cold, grey, February afternoon, United triumphed in a feast of football and goals, by 5-4. 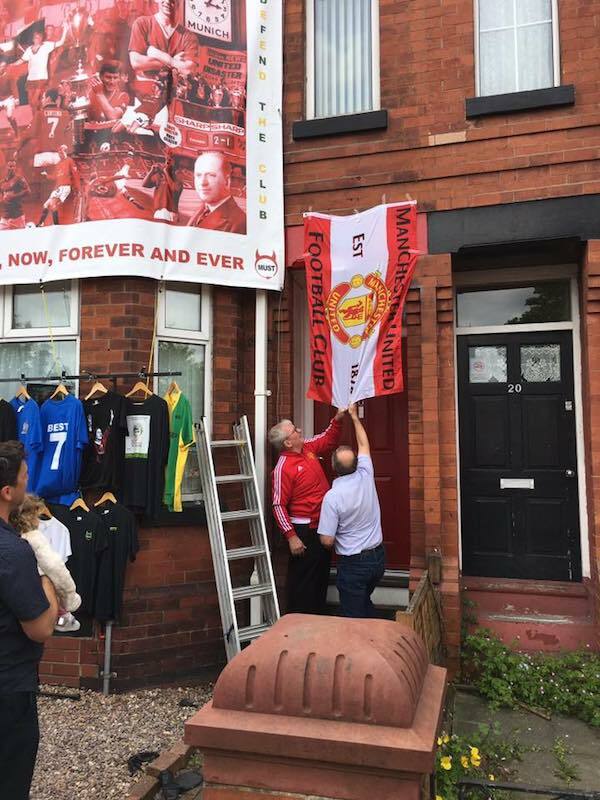 Sadly, for some United players, it was to be the last game of football that they ever played on their home, British soil. The party traveled back to Manchester by train immediately after the game, and the players and manager were in a very buoyant mood given their display at Highbury just a few hours earlier. Accompanying the party that day was a supporter; another Manchester business man by the name of Willie Satinoff. Mr. Satinoff had made his money in the cotton trade in and around the Manchester area. 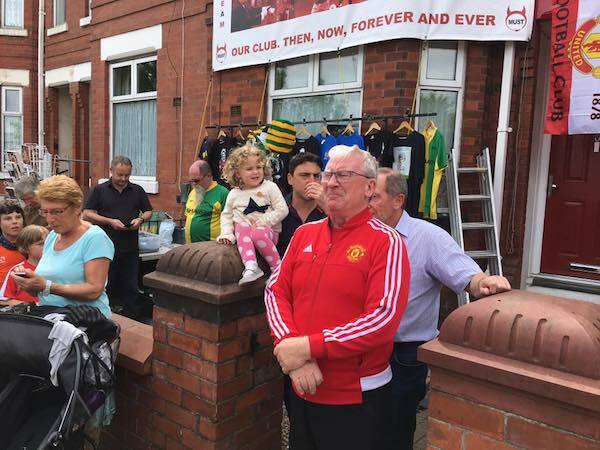 Outside of his business interests, his main pass time was following Manchester United Football Club, and he was fanatical in his support for his beloved club. Willie was close to Matt Busby. So close in fact, that he had traveled with the United team on all of their European exploits since their journey began in the 1956/57 season. 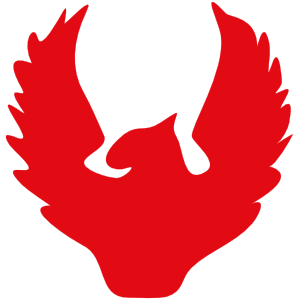 So it was that on February 3rd, 1958, he was the only fan traveling with the team out to Belgrade for the forthcoming return European Cup Quarter Final tie against the Red Star Belgrade club. At that time, it was commonly known within Manchester football circles, that Willie was being tipped to soon become a director at the Club which he was so fanatical about. Sadly, his hopes and dreams of attaining this position were shattered by the events of Thursday, February 6th, 1958. Willie paid the ultimate price for following his beloved United when he perished in that terrible accident on a snowy afternoon on the runway of the airport in Munich, Germany. Since that date, Willie Satinoff has fast become the forgotten man of Munich. Reams of paper have been written about events; radio and t.v. documentaries have covered the incident in great detail, but apart from Willie Satinoff’s name being listed amongst those that perished, he never ever, gets a mention. 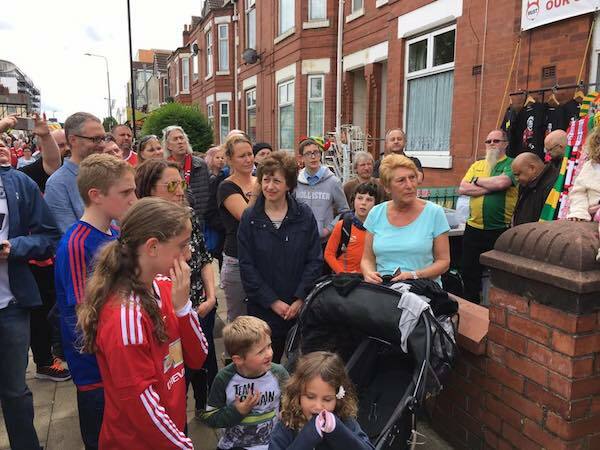 His resting place is passed by every day without notice, as hundreds of people make their way by various means along one of Manchester’s busiest throroughfares. Many I suspect are fervent Manchester United fans, who today, given the length of time that has passed since the accident happened, wouldn’t even know who Willie Satinoff was. 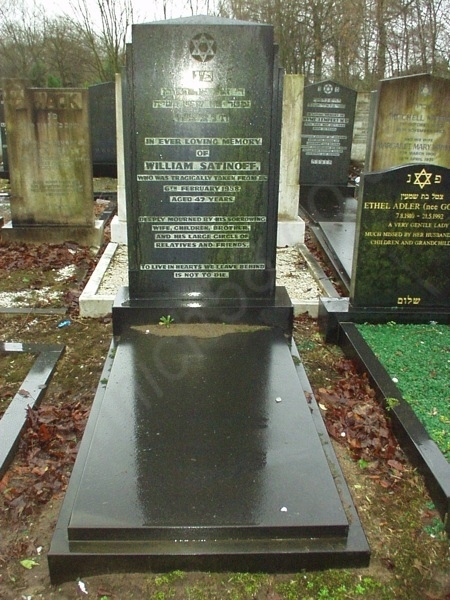 For those of you that may be interested, he rests in the Jewish section of the Southern Cemetery, Manchester, almost adjacent to the Manchester Crematorium. As you walk down Barlow Moor Road towards Princess Parkway, and pass by the Crematorium, there is a little gate which allows you entrance into the Jewish section of Southern Cemetery. Willie’s resting place is just down on the right hand side of the path, after you have passed through the gate. Unpretentious, just a plain black marble stone, sadly highlighting the details of the date, and where, this United fan passed away. That Willie has never ever been recognized in any way, by the Club, or anybody else for that matter, has always saddened me. But then again, why ever would he be? He was just a fan. But for me, he is an integral part of the Munich story, and one day, I would hope to see some kind of plaque erected to his memory at Old Trafford. 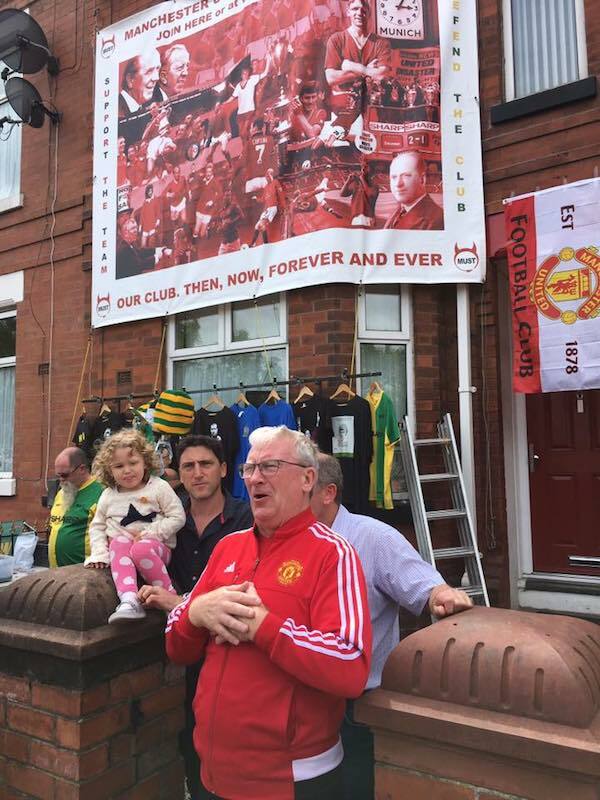 May 2017: Today the Manchester United Supporters’ Trust unveiled a plaque dedicated to Willie Satinoff above their front door on Sir Matt Busby Way. Tom Clare gave a moving speech before unveiling the plaque with a representative of the Satinoff family.